Awesome sink! So much room to wash our dishes. We’ve had this sink for years and it still looks brand new! It makes our kitchen look modern and trendy! Kraus undermount granite sinks create an instant style upgrade for the kitchen. Constructed from 80% natural granite, with the look and feel of real stone, these modern kitchen sinks look striking in a variety of settings. Clean lines and thoughtful design details highlight elegance of granite, for an eye-catching look with contemporary appeal. The extra-deep basins accommodate large dishes with ease, while the gently rounded corners make sink maintenance simple. Each non-porous, naturally hygienic sink is protected with a thermal finishing process, creating a surface that is highly resistant to heat, chemicals, scratching, chipping, and discoloration. 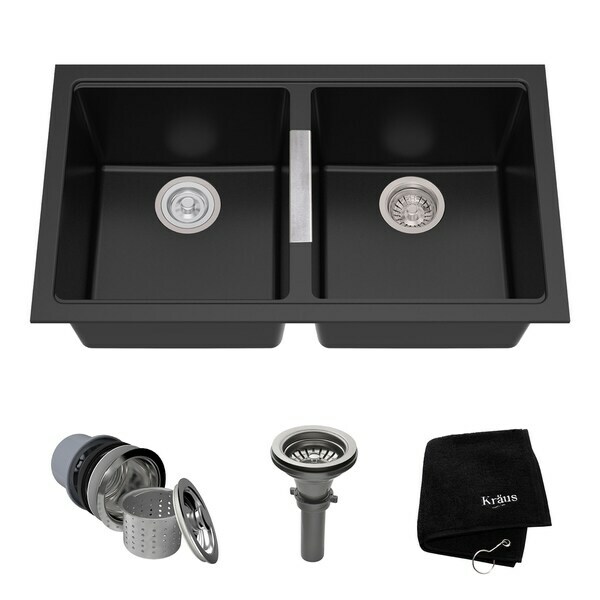 This double bowl sink provides a lifetime of functionality with refined style. The 50/50 split basin adds flexibility for a variety of kitchen tasks. For added convenience, a basket strainer drain assembly and complimentary towel are included free with purchase. Constructed from premium stainless steel, the top-quality basket strainer assembly creates a tight seal to prevent food and debris from clogging the drainpipe. For easy installation, all mounting hardware is provided. Experience Kraus Quality and bring your best kitchen ideas to life. Dimensions 31.5 In. X 18.88 In. X 9.5 In. I had this installed when I put black granite countertops in the kitchen. The bowls are deep, keep in mind, this sink has a flat finish. It works beautifully with the glossy counter. I am very happy with this product. Very large deep and awesome plus it looks expensive. love this sink. 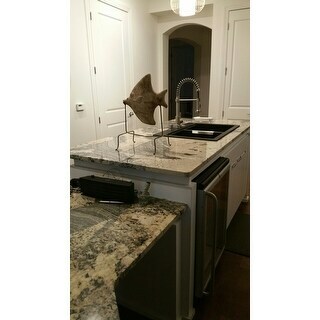 the contractor who installed the granite counter top along with the sink thought it was a great sink as well. This sink is great! 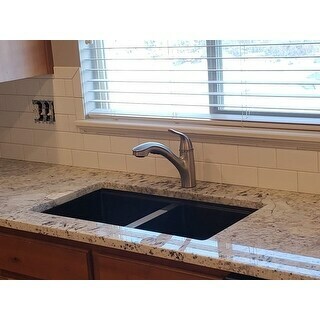 I love the look of the sink against my white granite counter tops and back splash. The matte finish really looks nice and dries quickly. I've never noticed any water spots. The quality is great and the stainless steel accent plate really adds some nice pop. Absolutely beautiful sink! It hasn’t been installed yet (waiting for countertop installation), but we’re super excited! Update: Installation went easy. It is DEEP! Love it! I am really loving this sink. It arrived quickly and with no damage and is just plain cool to look at. Love the deep basins and the stainless accents make it a unique addition to my soon to be completed kitchen renovation. Love the look in my kitchen and is the perfect size. Stays clean very easily. Very happy with my purchase of this sink and would purchase again. Great sink for the kitchen. Easy care and looks fantastic. Love, Love, Love this sink. it has the depth, and look i was looking for. the sink is sleek and understated but says industrial. i also bought a black faucet and this accompanies it well. Color, material, depth, size, value and all the excellent reviews. "Can this sink be ordered with Matching Colored Strainer and Flange?" "What are the measurements of this sink?" "Instead of an undercount could this be used as a top mount?" This sink is designed to be under mounted. yes it can we used either way. see my bathupdate as I had it top mounted. yes it can be installed undermount. "What is the silver on the center divider?" Hello LMR, it protects the sink from getting scratched according to the manufacturer. Thank you for shopping with us. "What is the weight of the Kraus 33' under mount 50/50 double bowl black onyx granite kitchen sink item # 16087369." Hello niya, the weight is approximately 47 pounds. Please let us know if you have any further questions.